Diamond Cut Productions Forensics10.5 Audio Forensics Software Upgrade From 7, 7.5, 8, 8.5 - Tracer Technologies Inc.
Now you can rev your Forensics system and bring the best and brightest Forensics Audio Tools under your DC Forensics 10 umbrella. Now you can upgrade to the latest and greatest from the engineers at Diamond Cut for a special low price. Version 10.5 also offers great new features that aren't found anywhere else! Channel Phase vs Time Plot View the relative amplitudes of L and Right channels vs time. Its like the XY plotter with the added dimension of time. Its a new view into your audio and shows some very interesting insights. Green Zones For All Filters Easily see what slider settings we recommend for all of our filters. This greatly simplifies the initial setup of our filters. New Serial Number scheme in 10.5 We have implemented a new more secure serial number scheme with 10.5. Existing serial numbers will not work, so you will need to re-register if you are upgrading. Many new example wave files added Some are installed with the product and can be found in the file menu. VST Hosting (VST Plug-in Support) Added It?s finally here! No you can incorporate dozens of filters made by other companies directly DC Forensic 10. The can be used like other DC filters, and they can even be used in the multifilter! Forensics Audio Whisper Enhancer Filter added (including 15 factory presets)This is much more than a tricked out expander. The new Whisper Enhancer takes a completely novel approach to digging out these quiet signals that drive you crazy. It?s especially useful for otherwise decent quality recordings that have not suffered from several rounds of aggressive compression. Subsonic Explorer This new tool presents the operator with a clear indication of energy at 30Hz and below and allow him or her to correlate its presence to the time domain waveform. This can be very useful in certain authenticity studies, especially ones that invoice analog edits. Forensics Auto Silence Chop-Out function This is great for those hours long surveillance recordings where 90% of it is silence. With this new tool, you just define the level of sound you want to keep and the program automatically marks all those silent passages. It will remove them too and product a CSV file with the exact spots the silence was removed. Forensics Histogram vs Time display added for analyzing entire files in a histogram domain. Comparative Histogram allows comparison of statistical distribution of two file portions with each other. Changed the software application ?look? to follow various flavors of Windows. Over 1,950 Descriptive Factory Presets are now provided for ease in ?getting started? with any given function. DC LIVE/Forensics was released in 2000 and and filled an important gap that was missing from the Audio Forensics world at that time. Previously, all Forensics solutions were based on expensive hardware that was difficult to use, hard to repair and even harder to upgrade. 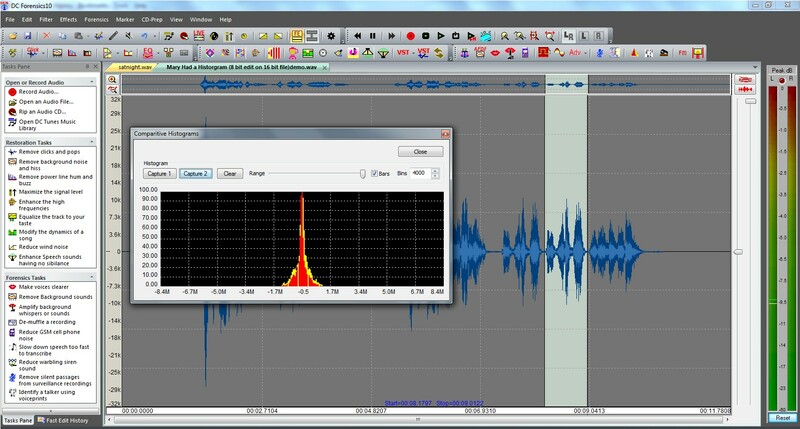 For the first time, Forensics customers were able to analyze, enhance and improve difficult recordings using only a PC with a sound card. Today, though you can still purchase tres expensive solutions, there is little that cannot be matched by the power of DC Forensics 10. There is also a very popular 3 day training class associated with this product that allows members of the law enforcement community, private citizens and other Forensics professionals access to thorough information on not only the product itself but full details relating to preserving, securing, and testifying to Audio Forensics methods. These features were added in our most recent version! Auto Voice tool - This is a Major new tool. It has two independent math processes that adapt in real time. One finds noise and the other finds human speech. These are then separated. This is a tool you should try first with any voice recording as it's so quick and easy. 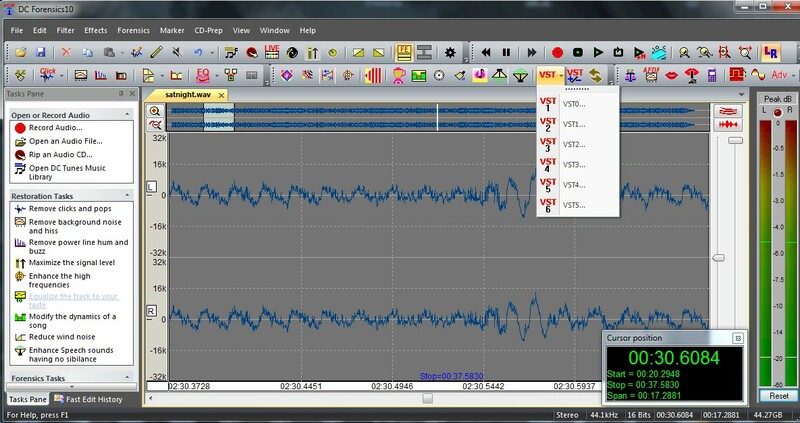 Cell Phone Noise filter - This new tool allows you to "teach" the program what a cell impulse looks like. It's then search out those impulses and remove them and replace the pulse with interpolated good audio. You'll find this is useful on a wide variety of cell noises that are picked up by nearby recorders. Spectrogram functionality - The tool has many enhancement but retains its super high resolution and fast speed. You can even scroll the spectrogram while playing audio. This is now a great tool to do authenticity studies. DeClipper Tool - now includes Two methods of repair of clipped and distorted signals. One has an adjustable strength and the other uses a method of frequency domain interpolation. The result is much more distortion is removed. Voice ID function - uses industry standard approach to allow you to see and rank the speech formants of a selected word, syllable or other speech. It also shows a frequency response plot and a Cepstrum graph. It provides the tools necessary for an expert analysis of speech characteristics. Overtone and sub-harmonic synthesizer - allow the operator to add some "fidelity" into muffled or otherwise hard to understand speech. Support for Flac, Ogg Vorbis and Broadcast Wave audio file formats. Click Here To See Everything DC Forensics 10 does! DC LIVE/Forensics has been shipping since 2000. We didn't get to be the World's Most Popular Audio Restoration Tools with a 12 item check list. This product is simply loaded. 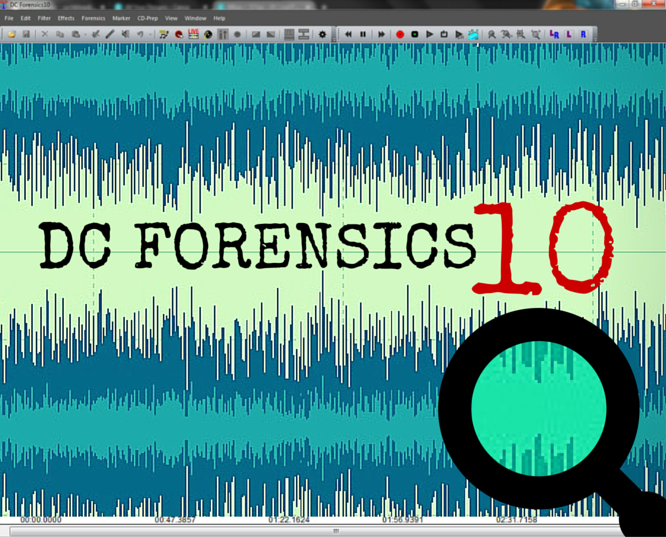 Created to help pull any voice out of the muck, DC LIVE/Forensics offers an impressive array of tools, with over 1000 presets, so that you can remove noise while you listen in real time. Higher resolution spectral filter offering a 32,000 band EQ- Filter sizes up to 65526 bands are now properly supported. Improved time domain adaptive filter- The stability has been greatly improved and the Normalized version of this filter is dramatically faster, especialy at very large filter sizes. Tune Library Organizes Your Collection- You can organize files by case, by investigator, even by time if you want! All files will be presented in one easy to use display and you can play, edit or burn them at any time. The World's Best Tools- There's a good reason that law enforcement agencies (that can afford any tools available) use our products for their Audio Forensics. Simple...they're the best! Anti-Artifact Mode-Push the filters harder with less artifacts! 30 Band Graphic EQ- For precise but easy to use equalization. Flashback LIVE Review- Excellent for surveillance work. If you are monitoring during live recording and need to quickly review, you simply hit the Flashback Rewind and you can re-listen, clarify the recording and even enhance the portion in question while the system continues recording without interruption. Real Time Coefficient Display Added To The Adaptive Filter- Now you can visually monitor the effects of the Adaptive filter and visually reaffirm the process as it marches through your file. Dual Stream Recording Added To LIVE Feedthrough- Now, when you record in LIVE Feedthrough mode, you can record 2 streams of audio. One is the raw, unedited audio while the other is filtered however you desire. This is an important backup when presenting your audio as evidence to prove that it hasn't been tampered with. Time Domain Adaptive Filter and Frequency Domain Adaptive Filter- These 2 new features help the software become "smarter" as it "listens" to your audio and applies its filters. CD Ripping- Digitally transfer tracks directly from CD and avoid analog recording. Turbo-Charged Algorithms- Now the software directly accesses your CPU on several critical algorithms, thereby increasing speed of those algorithms anywhere from 10-80%. Elimination of 2 Gig Windows Wave File Limit- Windows has a built in limit for recording a .WAV file of 2 gigabytes. For long recordings, as you close in on this, DC SIX simply starts a new file when you reach the end of the first and keeps recording. Snap To Zero Crossing- This new feature helps remove any glitches by automatically making your edits snap to the Zero digital crossing. AVI Audio Support - Now you can play AVI files within DC SIX and also remove the audio track and edit it. Auto-Leveling of Numerous Tracks - Now you can apply the new Auto Leveler to a batch of audio files and match the levels of all of them in one step. EZ Clean Auto Filter - This filter automatically removes clicks, pops, hiss, and hum in one easy process. Multi-Codec Sensor Support - DC SIX automatically scans your system for Codecs and adjusts to whichever ones you have installed on your machine. Audio Spectrograph - This tool is ideal for spectrographic voice recognition (voice prints) and acoustical analysis applications. Polynomial Filter - This allows the mathematicians, scientists, and engineers to create their own transfer function using a Polynomial expression. For those not so inclined, there is a plentiful assortment of presets to choose from. Spectral Filter (Up to 32,000 Band Graphic EQ) - This filter allows you to create a very high-resolution frequency response contour using up to 32,000 bands of equalization by using FFT techniques. It is extremely useful in Forensic audio applications for removing in-band and out-of-band extraneous noises because of its high degree of frequency selectivity and its very steep slope characteristic. Normalized Adaptive Filter - New mode allows even greater automatic filtering. Live Log To Disk with Notation and Automatic Time Stamp - Available in Live VOX mode?after triggering the automatic recording; time stamps are automatically applied as markers for each recorded event. Easy DeClick and DeCrackle - One of the most significant changes with DC5 has been in the EZ DeClick and DeCrackle. Not only has this process been made much easier to manage, it also finds and repairs a much wider range of clicks and pops. Fast Multi-tiered Editor - A brand new operating Mode for FIVE. This new mode of operation allows instant editing with each level saved in the Fast Edit History Window, so instant undo over numerous levels is easy. Cut/Copy/Paste instantly?regardless of file length. DeClipper - Very often, files will become ?clipped? if the input on the sound card is turned up too high and the sound card is overloaded. The results are usually distortion and a waveform that is ?flattened out? on top. The new DeClipper helps remove this distortion and reform the waveforms. Sample Rate Conversion - Quickly convert your files from one common sample rate and bit depth to another. LIVE Feed through Mode -Now you don?t need to necessarily have your audio recorded to the hard drive to take advantage of the numerous features. Live mode allows you to run dirty audio in the inputs of your sound card, set up your numerous filters on the screen and have cleaned audio flow out the output of your sound card in real time. Spectral Subtraction Filter In Continuous Noise - An amazing new feature within the Continuous Noise filter?very helpful in situations where you?re wading through recordings that are loaded with lots of ambient noise. Time Compression and Expansion (Stretch and Squish) - Now you can speed up or slow down the speed of an audio file and keep the pitch constant. .cue Sheet Support for CD Burning - You can now generate a .cue sheet that is compatible with many of today's most popular CD burning programs. Weighting Function added to Median Filter - This function from within the Median Filter allows you to control the Timbre of your wave file. Chebyshev response and 4th Order Slope added to Band Pass, High Pass, and Low Pass - These filters display relatively steep roll-off characteristics, but, unlike the Butterworth filters, have ripple in their pass-band. Filter Sweeper - A novel filter which allows the user to apply varying degrees of notch, high and low pass filters over time. This is perfect in situations where more filtering is needed at the beginning of a file. De-Esser with Variable Frequency Control to Dynamics Processor - This special compression algorithm is tooled directly to remove hard ?s? sounds that occur in older and poorly recorded files. Pencil Wave Form Drawing - Now you can zoom to single sample resolution and manually draw out clicks and pops that show up as spikes in the waveform. Time Bracketed Play Range - Allows you to audition a selected area or play from the cursor and add a predetermined amount of space on each side. This is particularly useful when trying to zero in on a problem area. Timer Recording - Just like your VCR?you can set your software to begin recording at a certain time and end recording later. This can be set to be a one time recording or a daily recording. Distortion Analyzer - New to the Spectrum Analyzer?measures the THD (Total Harmonic Distortion) of any device. Peak Hold Added to VU Meters - Newly designed VU meters more closely resemble a high end stereo system readout. Dithering Options for Resolution Conversion - Both Save as and the Sample Rate Conversion tool allow you to select from 3 different dithering options?Flat Spectrum, Triangular High Pass, and Noise Shape 2. AIFF to wave file Converter - Simply open an AIFF file within the program and it?s instantly converted to a wave file. You can now easily work on your favorite Mac files and then export them back to their original format. Drag and Drop File Support - Drag and drop any audio file supported by the program and it opens and converts it automatically. Export Playlists - Export your playlist in a standard text file so that it can be used by numerous label making and CD writing programs. Import/Export Preset Files - Now you can share your favorite Presets with other users of the Enhanced Audio family via the Internet. Hundreds of New Factory Presets (Over 1000 Total) - Always a great starting point. We?ve added a ton of new tools to this version; we?ve also followed it up with an incredible amount of ?factory? presets to help get you in the ballpark. New Keyboard Accelerators - We are always searching for ways to make the product easier to navigate. The accelerators just give you quick shortcuts to menu items. Print Waveforms or any Screen Shot -A simple Print Screen function has been added with notation capabilities. Up to 192 kHz Sampling Rate Support - Now all popular sample rates and depths are supported. Instant Channel Selection - Quickly and easily audition Left, Right or Stereo?even during playback. Apply any filter to either channel with one click of the mouse. Signal Generation Functions - White, Pink and Brown noise generators added. Lock Markers Function - Lock your markers in place so that you can?t accidentally move them while working. Marker Naming Function - Name your markers with text labels. Selectable Fonts and Colors - Manage your working environment to please your eyes. Windows WDM as well as MME Support - Will support virtually any sound card. High Res Spectrum Analyzer Added - Now capable of resolving frequency increments as small as 0.02 Hz. Graphic EQ - Ideal for Forensics applications. Still not enough specificity for you? Alright...let's do it this way...here is a complete list of features in alphabetical order...we've done this in order to not miss a single item...just so you know every minute part of DC LIVE/Forensics. Convert Redbook Audio on a CD to a .wav file. There's no miracle cure for analog distortion, but this tutorial gives you a good shot at reducing it dramatically. 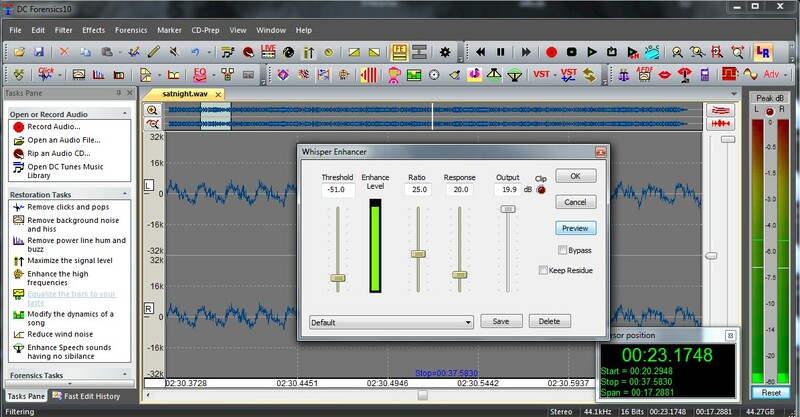 Take a peak inside the Spectrum Analyzer and learn how to better use it for your audio work. 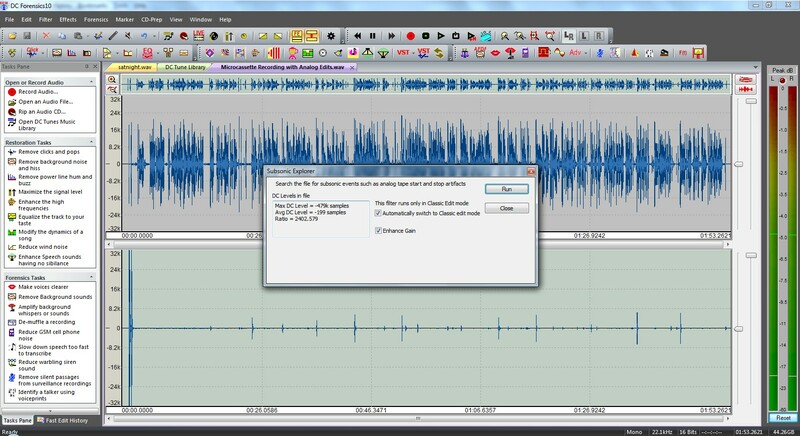 Try this novel approach and tool for removing distortion from your audio files. This indepth tutorial walks you through this cool visual analysis tool. Fool your soundcard into working as a better monitor for your audio work. We all listen to MP3 from time to time, but this audio is certainly different from the CD quality recordings we're used to...this will help you improve them. How to load codecs into your system and use them to improve your work. What Are The Correct Levels For Recording? So where should your level meters be when you're recording into your computer? You might be surprised. Use One Mixer For Input and Output Simultaneously! These handy hints will help you get the work of 2 mixers out of one! Have To Send Large Files Over Email? Here's An Easy Way. This handy service is free and lets you send big files to friends and co-workers. Why Should I Run A Balanced System? Are balanced systems better...do you need one? The Damage Of Dropouts...How To Stop Them. Gold CDs...Are They Really Better? Should you be making more use of Gold CDs? We'll tell you the facts. Get more out of your Diamond Cut Product...At least twice as much! Lurking In Diamond Cut is a mysterious world...should you visit? What are all of the files that Diamond Cut uses? You'll notice more than just Wave files in Diamond Cut. What do the other files do? Cells are everywhere and so is their noise. This tutorial wipes out cell phone noise! Which Sample Rate And Bit Width Is Best For Audio Restoration? Where should you set your recording in order to get the best files for Diamond Cut? Learn more about audio connectors...be smarter...be happier. Do you have what it takes to make a career out of Audio Restoration? Ever wanted to record what you're hearing on the Internet or other streaming sources? This handy tutorial will make it simple. Backing Up Your Precious Audio...The Best Way? You've invested a bunch of time and effort into restoring your audio collection...this tutorial will help you guarantee it doesn't go to waste. DC LIVE/Forensics is an incredibly powerful product. This demo should help you get your feet wet. We also suggest that you download the Getting Started Guide that is also listed here. This guide will help you easily get set up and also lead you through a few sample restorations that are included in the demo. All of the filters in DC LIVE/Forensics work in a similar way, so these brief tutorials, while easily completed in minutes, will help you become very familiar with this powerful product. You probably won't need any additional help, but don't be afraid to call our 717 764 9240 help line if something doesn't seem right to you. The entire product manual is also included in this demo. After you install, just search your computer for the following file: Forensics10 User Manual.pdf. It should be in your documents file.